Because weird summer with varying temperatures, weird rainfall patterns, all of which have resulted (in my homestate of Maryland) in a bumper crop of pickling cucumbers. Because also…cold, crunchy and satisfying. Oh…and super low-cal! So this actual pickle adventure started in January. During a blizzard. Well that’s sort of misleading. I wasn’t actually in a blizzard. But my beloved city of Baltimore was. Meanwhile I was nice and cozy hanging out with my good, good friend Pam in Michigan where, oddly, it was warmer and drier than Baltimore. And she had pickles. She and her niece, Krista, had gone on a mad pickling spree and pickled…well, everything. Literally, all the things. They pickled. And it was soooooo good. Those veggies stayed on my mind as I went back to Baltimore and through all the adventures I’ve had since. Now that I’m in the new and improved Casa de Nikki I decided to give pickling a try. I’d made a few half-hearted attempts in the past but nothing really worth talking about. But this latest batch was by far my best, which is why I’m sharing it with you! I’m also sharing it because it represents a watershed moment in my career as a Foodie. It was the moment I actually let go of perfection (as my buddy Andrea likes to say) and embraced a few shortcuts. But I’m getting ahead of myself. Let’s talk pickles. I decided I wanted spears. The cukes I got were just a tad large to be taking on as a whole pickle. I was trying to imagine myself using the pickles. Which, for me, would be later in the evening, in my pajamas, wanting something crunchy but not caloric. Do I really want a whole pickle at this point? I really don’t think I do. So I went with the spears. I could have done slices, like the ones you see above. That’s from a smaller “test” batch I did a few weeks earlier. The girls said they tasted “interesting” which in teenager means “they don’t taste like the sodium bomb/uber-processed pickles you’ve been feeding us our entire lives.” I blame myself. I’m trying to move past it. From there the process is fairly easy! I used this recipe as my starting point, but deviated from it (cuz I like to play with my food!). I’m giving my recipe but if you want a “base zero” use the linked recipe and tweak it to your liking! The biggest deviation (and time-saver) was that I visited my handy-dandy Amish market and picked up some of their pre-made pickling spice (pictured at the top of this post!). Much as I love spices, my spice cabinet is a little bit out of control. I’ve put myself on pause from buying any more spices until I use up some of the ones I already have (or give them away). So having the all-in-one pickling spice was nice! But in reality you can get creative with pickling. If you like spicy, you can add things like red pepper flakes or even cayenne pepper or Old Bay. If you like sweet pickles you can do your favorite sugar substitute. If you want whacky…well, I dunno what to tell you but my main point is you can customize your pickle to whatever you want and like. Then, literally, it takes like three days for them to pickle in your fridge. Which is the main selling point for me! I want instant gratification, folks! I purposely made a gallon sized jar because my boyfriend and I at least like homemade pickles a lot. (The kids, like I said, are lost ones…) You don’t have to make that many. If you want to start small, I’d say get about 2 lbs. of pickling cucumbers and have at it. Summer means cold, refreshing pickles. This super-easy method and recipe makes a gallon-sized jar of pickles you can use to make pickle spears, pickle chips or whole pickles if you like! Rinse cucumbers thoroughly in a colander. Set aside. In a pot, bring vinegar and water to a low-boil. Drop your heat down to low. Add salt, garlic, pickling spice and red pepper flakes (if using) and bring it back to a boil before turning off heat and allowing the brine to cool. 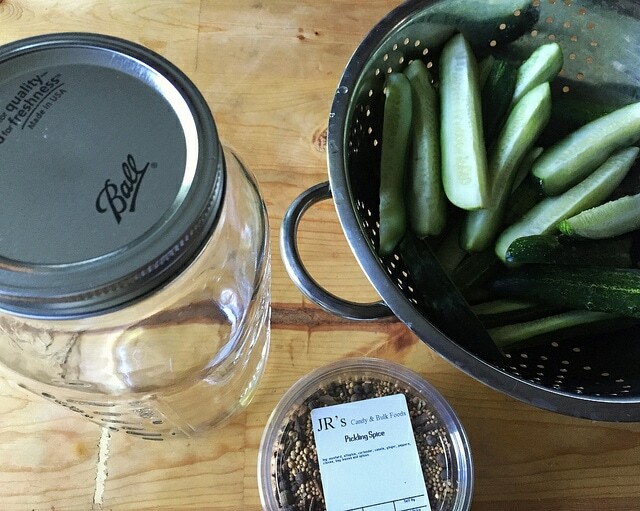 Pack a gallon canning jar first with your dill, then with your cucumbers. 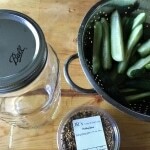 Once brining liquid is cooled, pour it over the cucumbers and place the lid on the jar tightly. Leave it on the counter for a few hours (it gets the pickle party started), then refrigerate for three days before eating. Also if you want to downsize this recipe, remember that there are 4 quarts in a gallon. So devide ingredients by four and you should be good to go! It may seem at first as if you have extra liquid but I found that if I really packed my pickles down well it all fit! Remember they should be packed tight!